It’s hard to believe we’re just days away from Christmas. I hope you’re having fun savouring the season, perhaps whipping up some baked goods to delight your friends and family with. 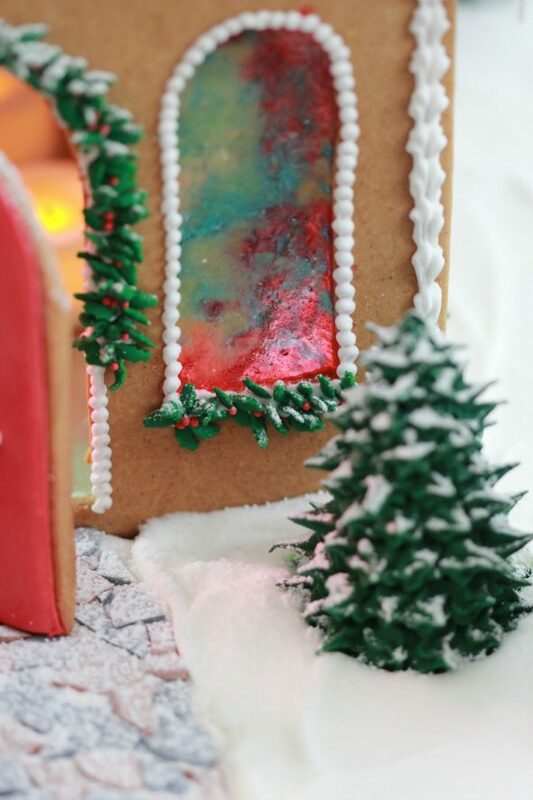 Over here, I’m glad to be able to share this with you, albeit cutting it a bit close to the end of the holiday season, but hopefully you can use some ideas or tips I’ll be sharing for this year’s gingerbread house or for another. 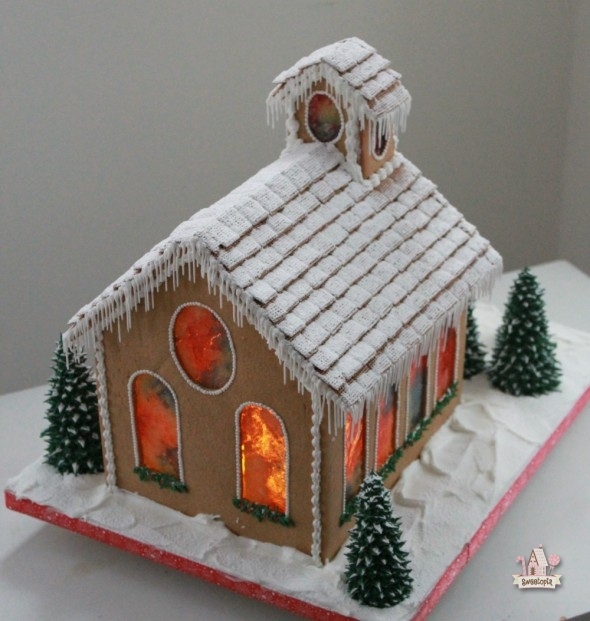 Although this gingerbread church or chapel may look complicated for a first-time gingerbread house maker, it truly is straightforward to make if you have the right recipes and some little secrets to help you along the way. Before I dive into sharing the details, I have to say, there’s something somehow magical about putting a gingerbread house together. It’s the candies involved in making it, the rich aroma of gingerbread and sweet royal icing, the satisfaction of building a structure and adorning it, seeing the joy it brings others who receive it as a gift, and really and truly, the whole cuteness factor. After building a house I just wish I could be miniature for a few minutes, to experience the house Alice in Wonderland style. I hope you try to make one too, and please let me know if you have any comments or questions in the comment section below. 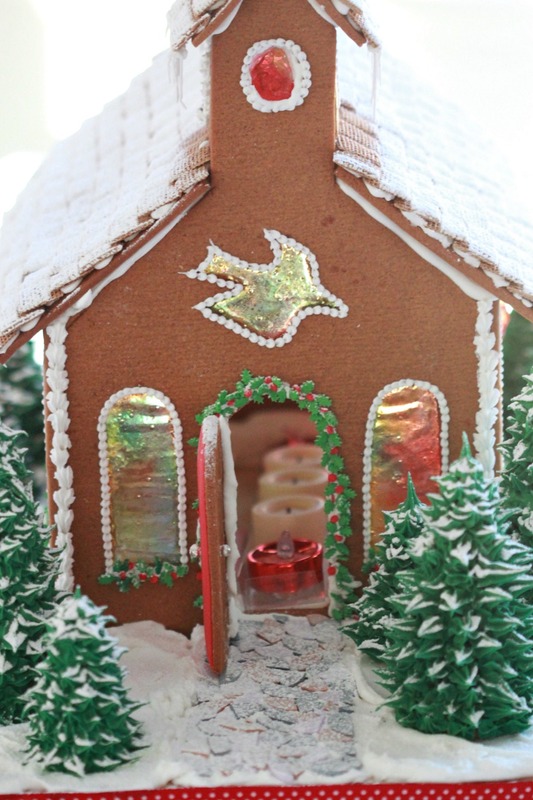 *Update; I made another gingerbread church, the same style, this year and have added those photos to this post, so there are actually two different churches pictured here. The short video below shows the newer one. Thanks goes to Woman’s World magazine for the template! 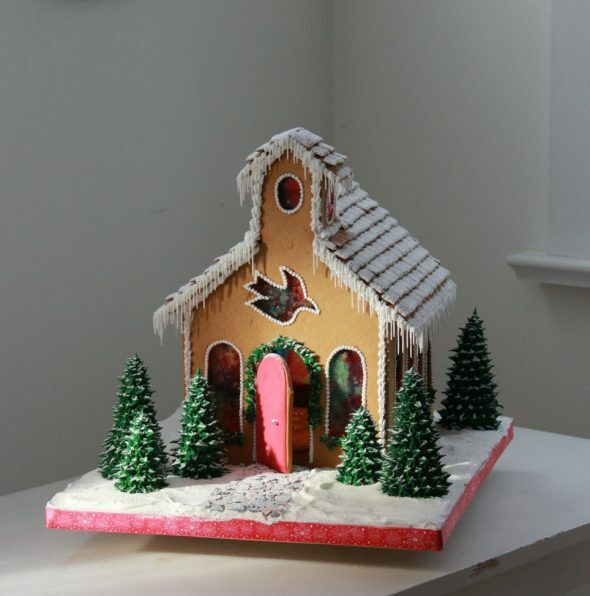 I would appreciate if you know the year and issue this Gingerbread Chapel was published… All I have are photocopies of the pages including the chapel, and the credits at the bottom left of one page, stating; “Photos: Bill Milne. Illustration: Roberta Frauwirth. Recipe development, food styling: Karen Tack. Prop stylist: Candace Clark.” A former student of mine’s mother owned a copy of the magazine and she brought it in for me to photocopy. I’m sorry I’m not able to share a template due to copyright reasons, but I hope to have another version of my own template ready for you for next Christmas (much earlier than Dec. 21st of course!). 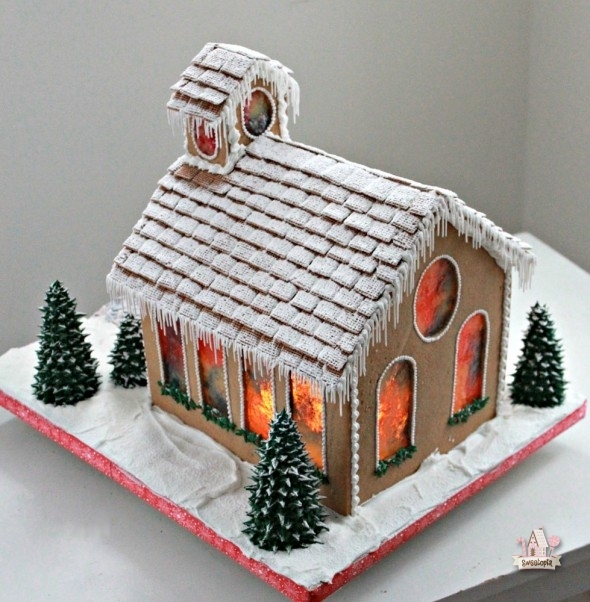 I do have another template for a basic gingerbread house here if you’d like to try it out. Please also pardon the zillions of photos… I had fun taking pictures in all sorts of different lighting. 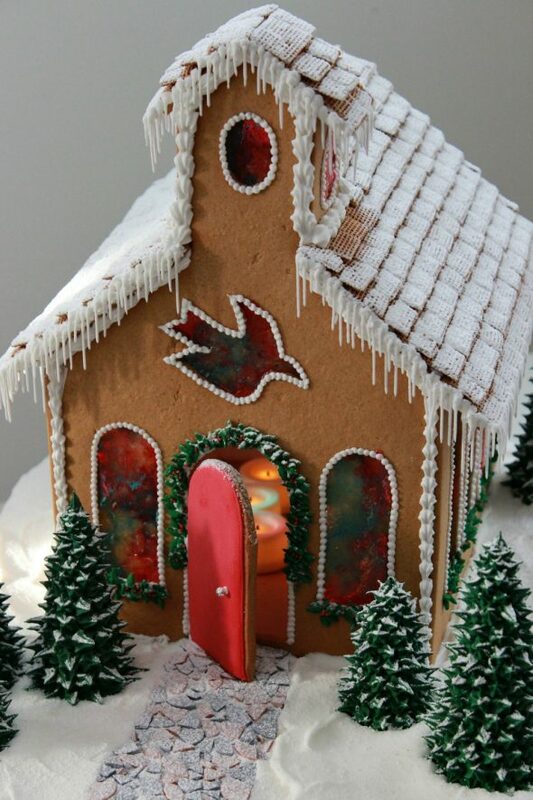 The gingerbread church really does look different depending on the time of the day. 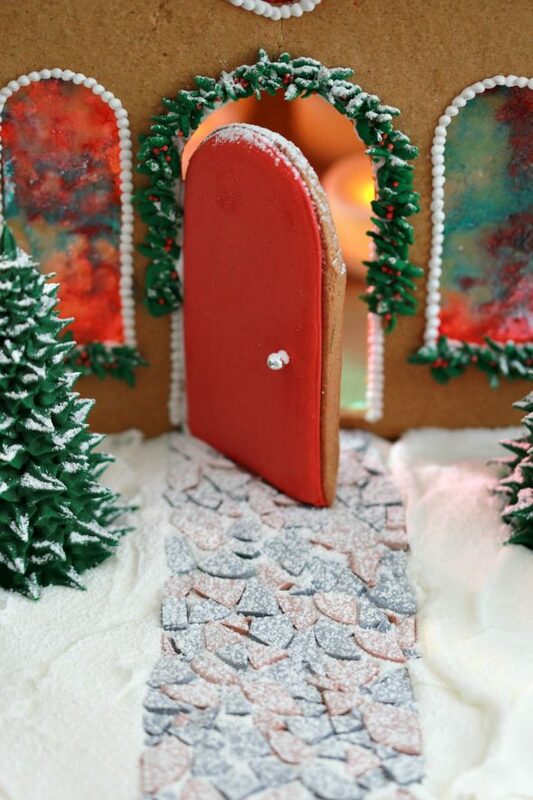 To begin, you’ll need to make your gingerbread dough, cut out the pieces and bake, and prepare your royal icing. The recipes are key to success. The ones shared with you below are my absolute favorites. The gingerbread recipe can be found here. Do check out this post on preventing cookies from spreading if you’re new to baking cut-out cookies. A few other tips; I like to roll my dough out between 2 sheets of parchment paper and I like to roll my dough thinly. Mine for this church is about o.5 cm or just under 1/4 of an inch. 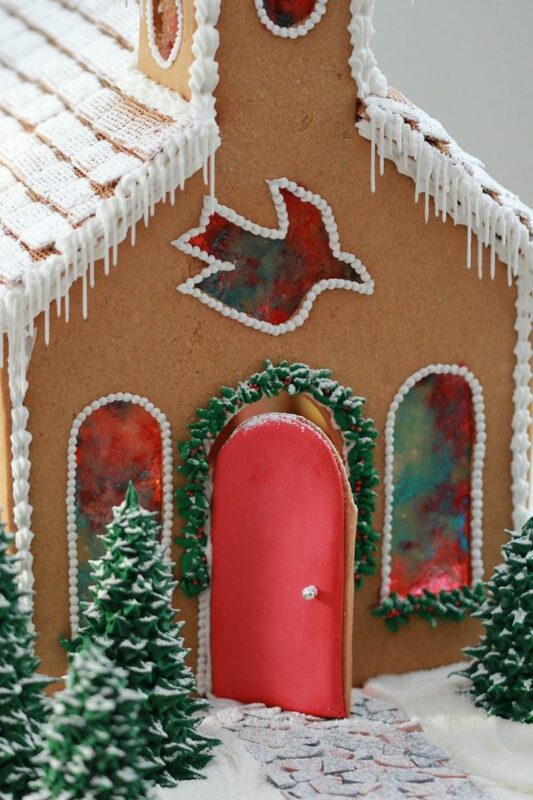 The gingerbread pieces are then crisper and lighter, and it’s easier to put the house together. 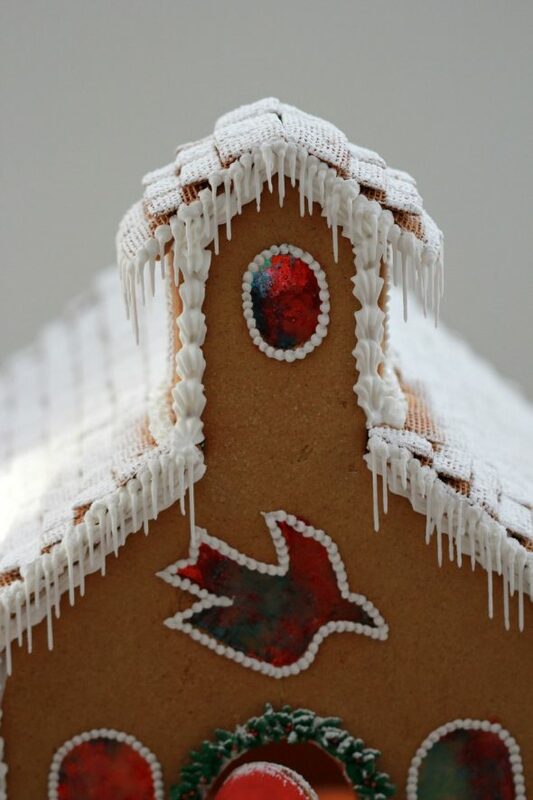 Here’s a video and recipe for you on how to make gingerbread house royal icing. 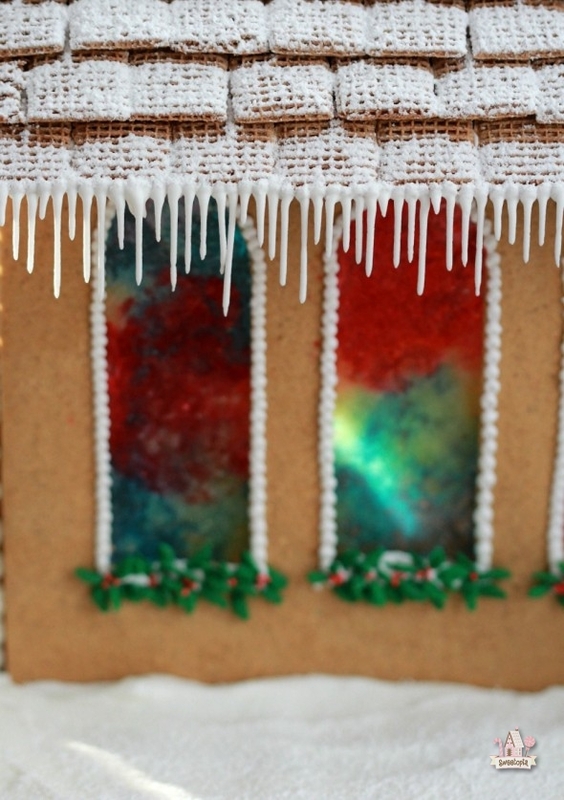 There are a few ways to make stained glass windows for your gingerbread house. 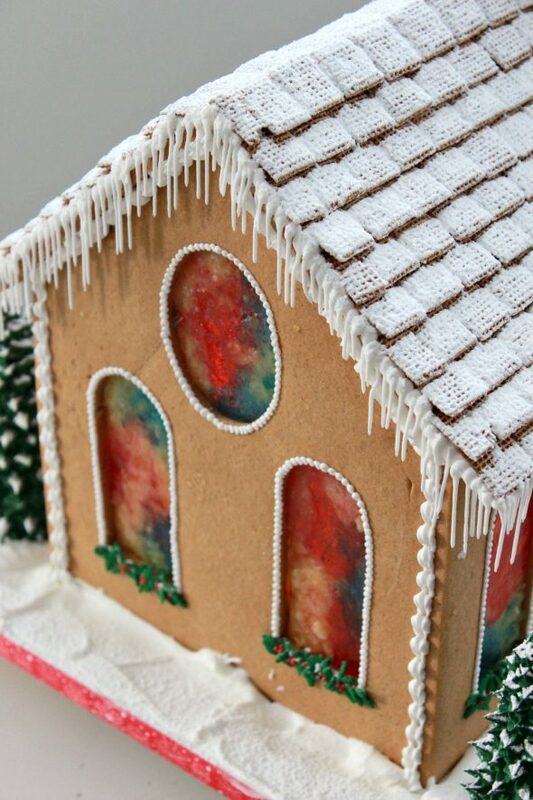 Either crush and melt the candy on parchment paper and then adhere those pieces on the interior of the gingerbread house window openings, or crush the candy and melt it while baking the gingerbread pieces. I used the second method, which I’ll explain in more detail. 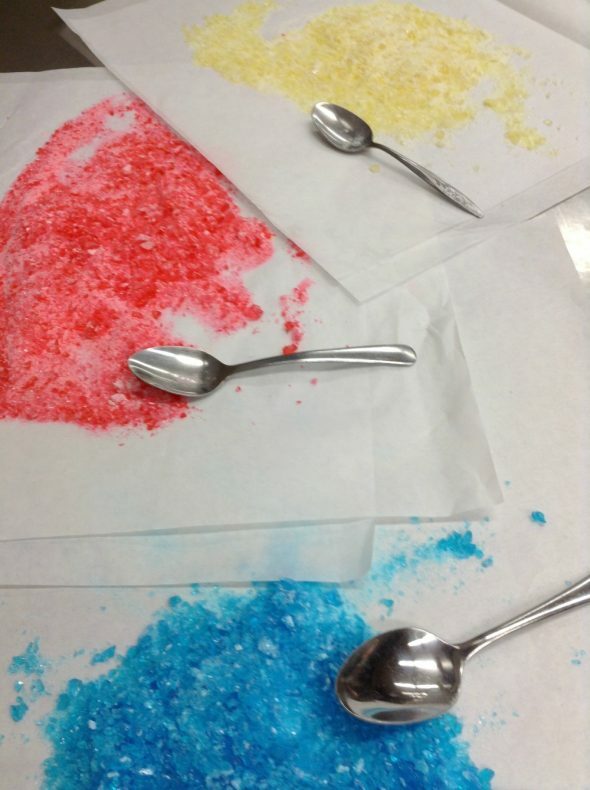 First, you’ll need to crush up some candy into powder and/or small pieces, by placing each color candy in separate plastic food storage bags and crushing with a meat mallet. Jolly Ranchers (hard candy) are my favorite candies to use as I find they melt the clearest. I even prefer it to melted isomalt . Unfortunately I couldn’t find yellow jolly ranchers locally and didn’t have time to shop on line, so had to use yellow Life Savers . *Update – This year I only used blue, red and green jolly ranchers, and I like the result better! The green actually melts to look somewhat yellow. 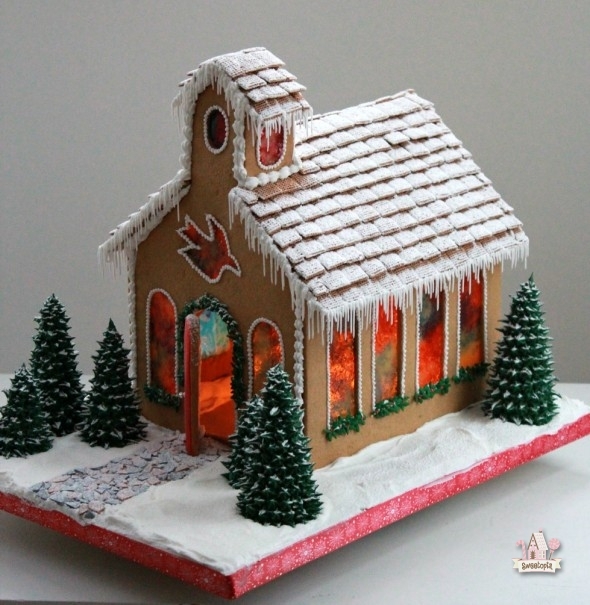 See the photo above the words “Gingerbread Recipe” for this years gingerbread church. 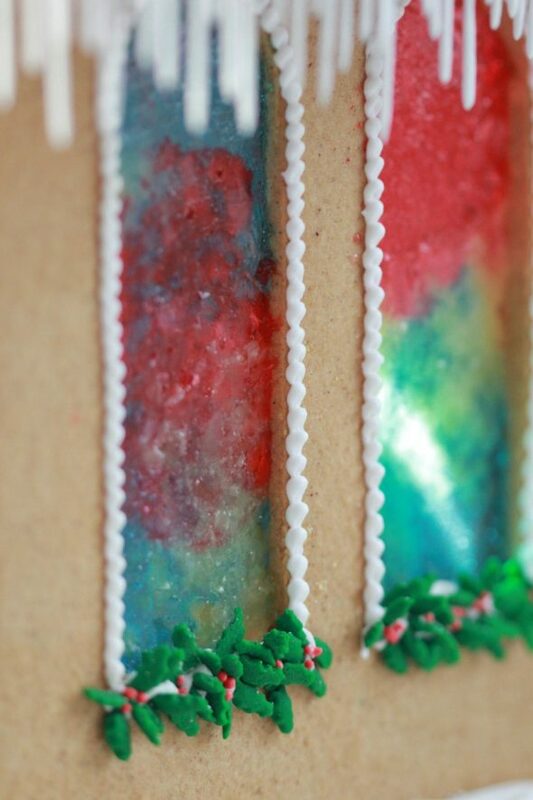 Once you’ve baked your gingerbread pieces until almost done (I took out my pieces with approximately 3 minutes left to bake), spoon your candy randomly into the cut out windows. Bake for the remaining time (3 minutes), or until the candy melts. You can see on the finished stained glass windows below that the yellow didn’t melt as much and is not as clear. Be sure to fill windows generously with crushed candy before baking… I noticed one window didn’t quite have enough at the edges. You can see it more at dusk when the house is lit up, in the photo (below), in the bottom right window. 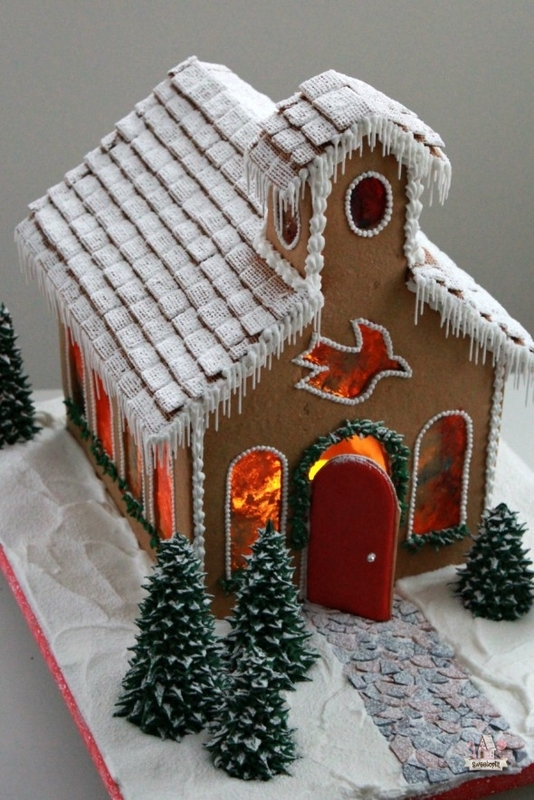 Once your pieces have been baked, decorate them with icing or small candies, like the holly sequins in the photo below. It’s much easier to decorate the walls when they are flat. I also flooded the door with royal icing. 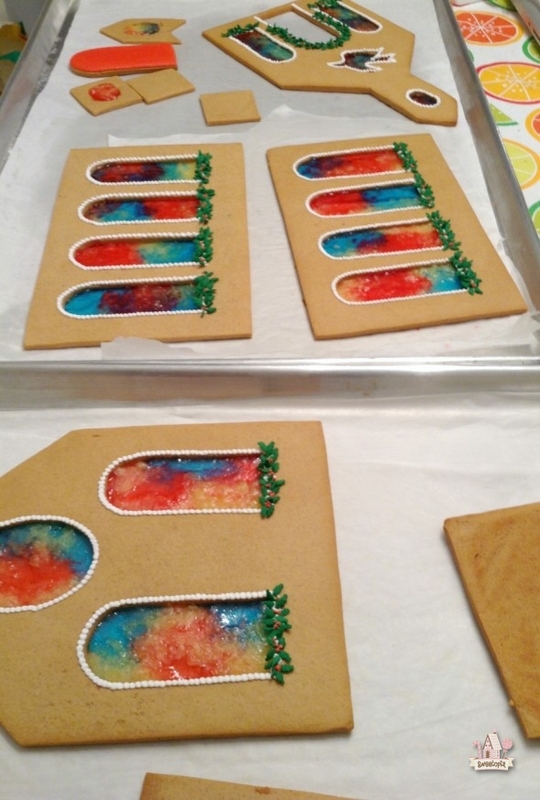 The icing consistency for flooding is different than the thick consistency used to put the gingerbread house pieces together. Please see here for a video on royal icing flooding consistency. 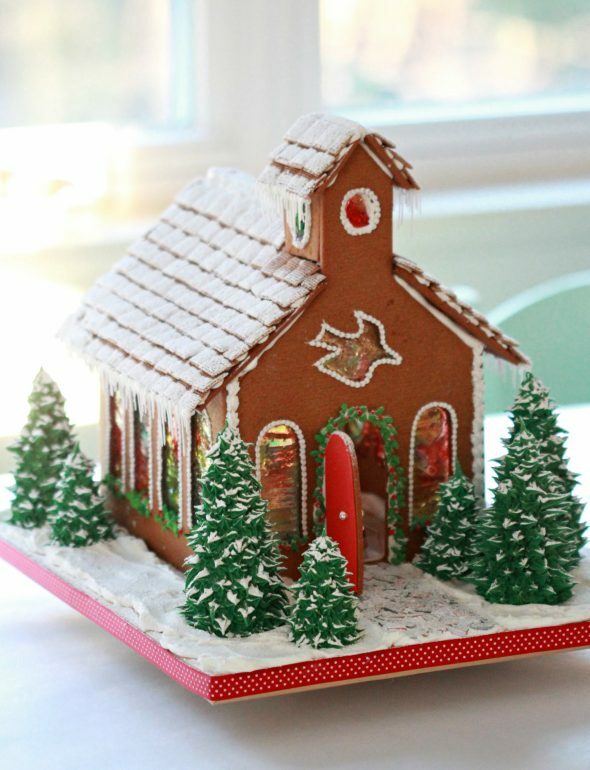 Let the details dry before assembling the house, so as prevent candy (such as the holly candies below) from sliding off. You’ll need to let the pieces dry for about half an hour at least. 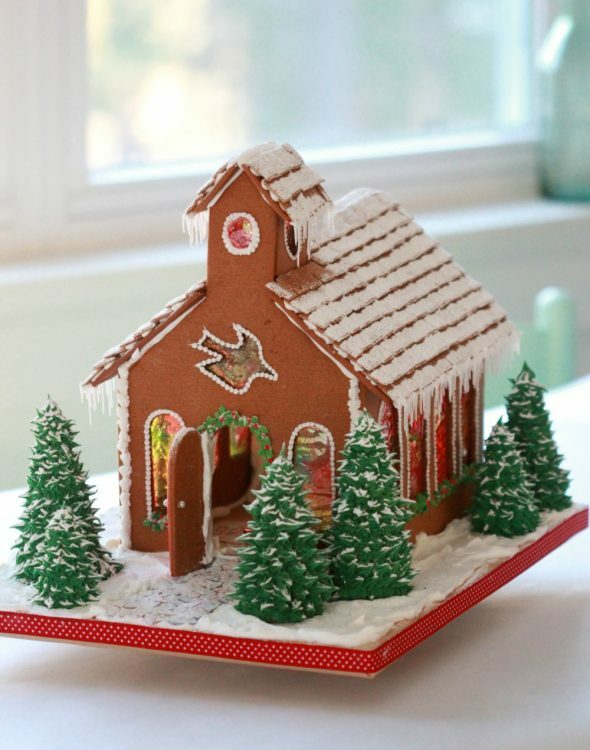 Here’s a video for you on how to put together a gingerbread house. Be generous with your royal icing. I let the church walls dry overnight and attached the roof the next morning. If you’d like to light up your house, there are several options, but the one I chose was to use battery operated tea lights. Either place the lights inside the house before the roof goes on, or, as I did, slide the tea lights in before the door is attached. With some effort the lights could still be taken out with the door on. 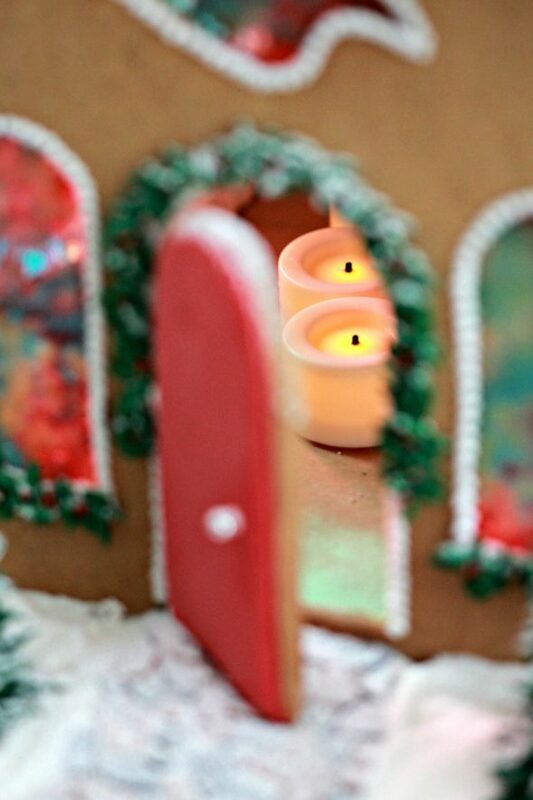 My father had a great idea which I’ll do next year… Glue the tea lights onto a sturdy strip of paper which could then be slid in and out of the gingerbread house to turn on and off the tea lights when needed. 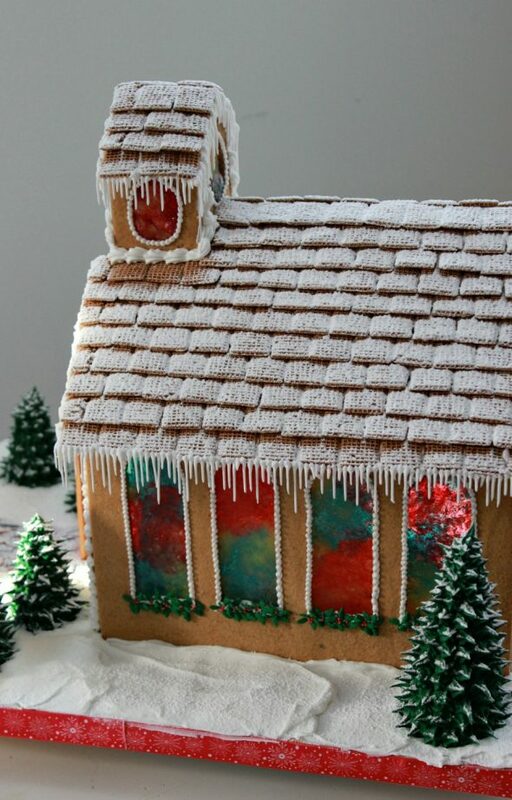 There are so many options to “shingle” your gingerbread house. I used Shreddies cereal and, using a sieve, dusted the entire roof and yard with powdered sugar. You can see a video on how I put the roof pieces on here. 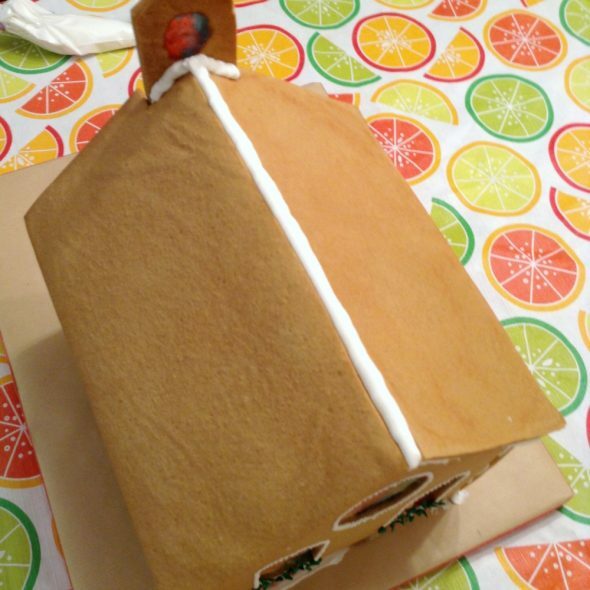 It’s a different gingerbread house but the technique is the same. For the icicles, please see the how-to description here. To cover or finish the edges off where the walls meet, I used a star tip #14 and #18 and piped shells from the top to the base of the seams. I did find though that the #18 seemed a little too large (see the front of the steeple), and will stick with only star tip #14 next time. You can see an example of tip #14 where walls meet, on the left hand side of the photo above. 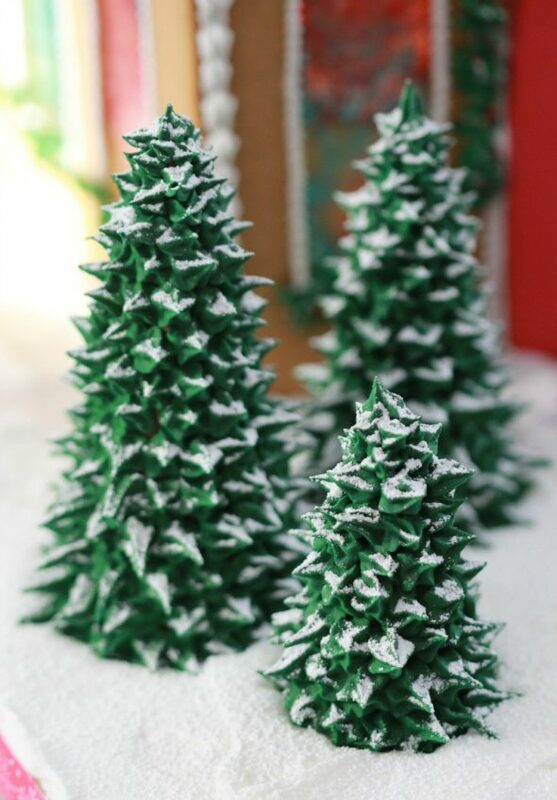 For a how to on making the icing trees, please click here. 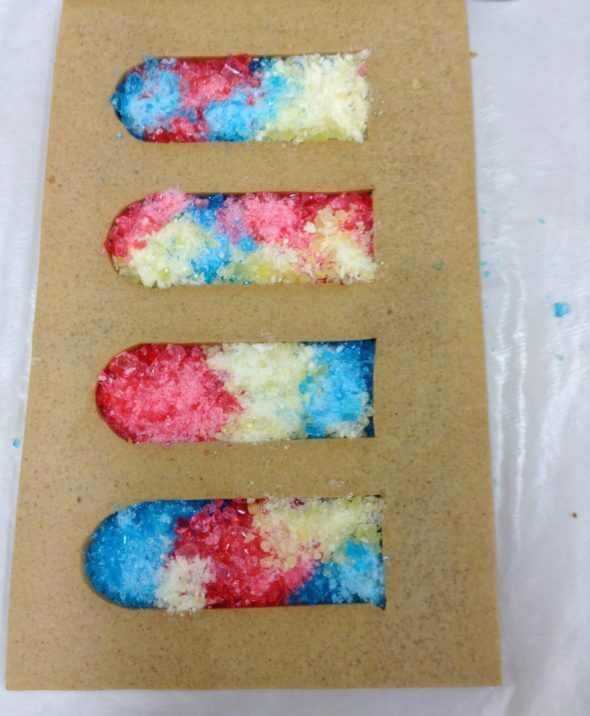 The candy pathway is made up of brown and grey Necco Wafers , cracked and placed on wet icing. To finsih, cover your base with royal icing spread with a butter knife or palette knife and sink your icing trees into the wet icing. Dust with powdered sugar and enjoy! This is so pretty. 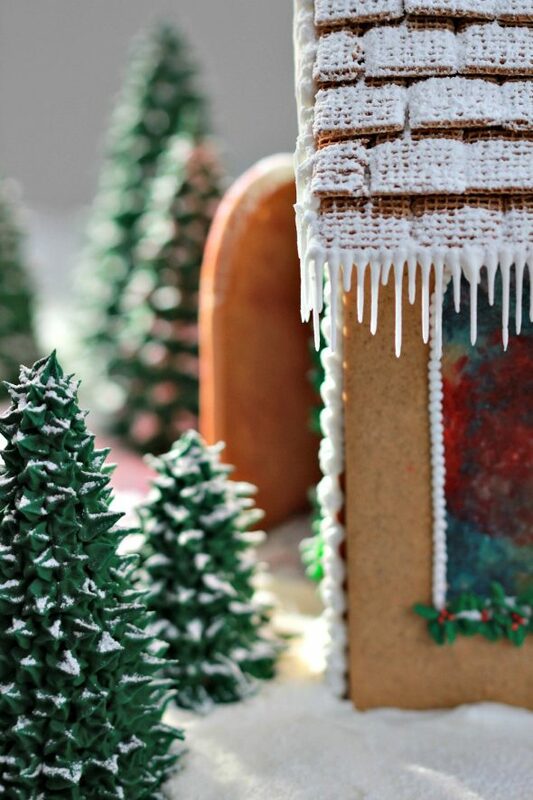 I love building gingerbread houses….this year I totally wanted to live in the one I made so I totally get wanting to be miniature in order to o inside. 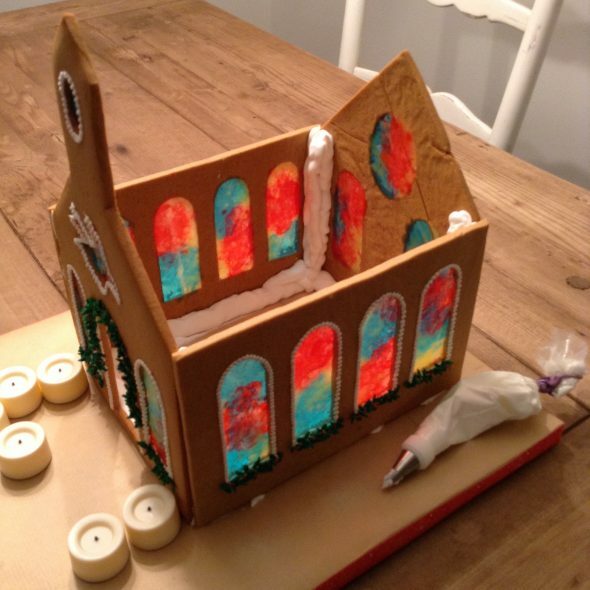 LOL I think I want to do a church next year….your windows are so pretty! I love this! Saved for next years ideas! This year I am making a simple farm with my grandaughter. Very beautiful! I love it! Lots of good tips how to be successful. Thank you for sharing all your hard work and talents. You make it look so easy. 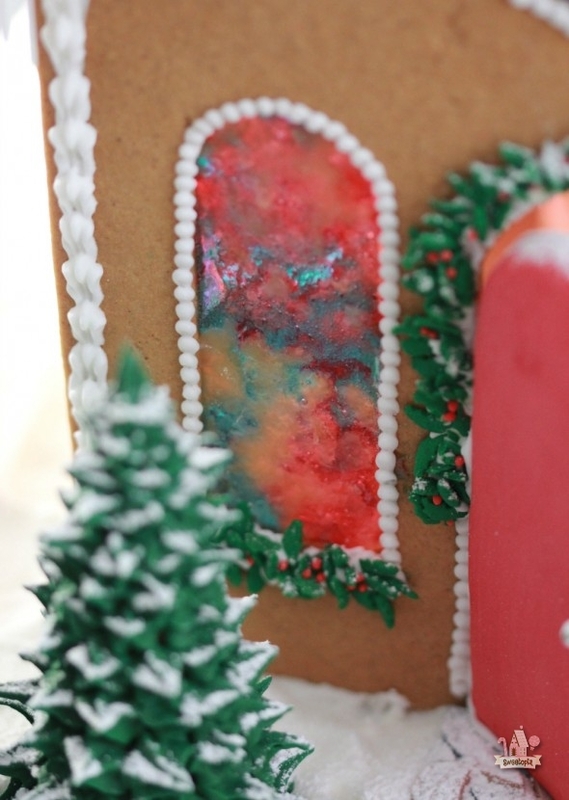 This is one of the most complete gingerbread tutorials I’ve seen! Thanks for posting it. I’ve never made anything gingerbread although I’ve always wanted to try. I would really like to have access to the template if possible. Thank you! Just stunning, Marian!! I want to try making one at sone point! Thanks for all your great tips. Merry Christmas to you and yours. Hi Marian, I hope you had a wonderful Christmas Day with your loved ones, as I did here in Australia….hot weather here as usual. I have followed your web page for quite a while now, and have made, using your gorgeous template, & your video’s, a number of gingerbread houses for family and friends, with great success, so thankyou, everybody has loved them. I always now make a couple of basic ones, using your template, then the Grandchildren decorate one each (2 grandchildren), and take them home to enjoy what they have worked so hard at. 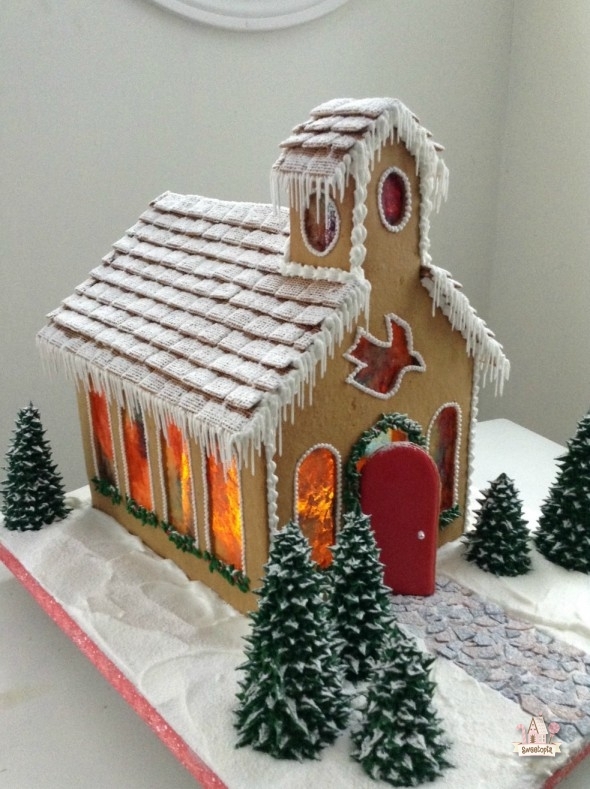 I would love to attempt a gingerbread chapel next year, so am looking forward to seeing what you have worked at next Christmas for us to follow. Again, thankyou for a lovely web page. Marian, this is brilliant and lovely. So clever! I saw it too late for this year, but I sure do hope I can remember to take a stab at it next year! Speechless and inspired! Just love you and your creative soul! Please never stop posting and filling my creative soul with beauty! I love this house so much and have some questions. I just made a template! 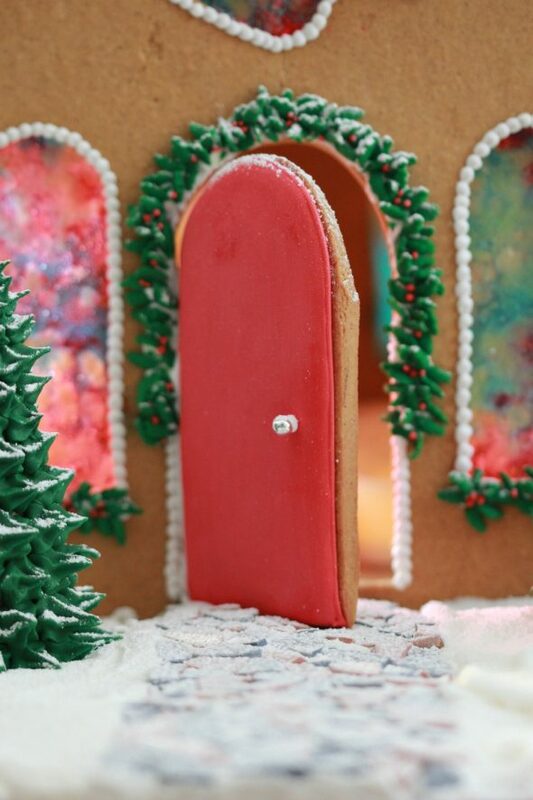 Did this take just one recipes worth of gingerbread? 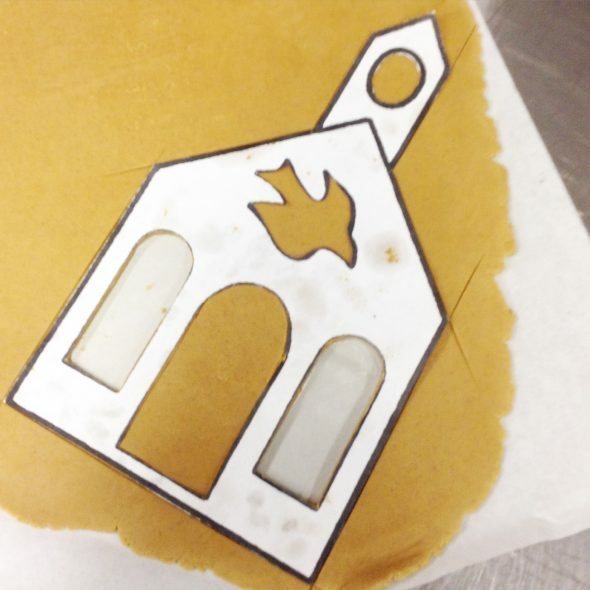 Did you cut with an X-acto knife and transfer to bake or did you cut right on your parchment-lined sheet? I don’t see how you could do that without ruining your pan and cutting your parchment. I used 3 of my gingerbread batches, and had leftover. I made sure to roll the dough very thin, to make walls lighter. I place the dough, which is still on the parchment, onto a cutting board, and use a short paring knife and pizza cutter to cut the pieces. I then bake the pieces on *the same* parchment – I don’t peel the pieces away from the parchment, I peel the gingerbread around the house pieces, away from the parchment. If the parchment gets cut, that’s okay, I just transfer the pieces (with the parchment stuck to them) to a baking sheet. I adore your church! I am going nuts trying to find this template. Is there any chance you can sell a copy to me or point me in a direction where I can locate this. I have spent about 2 hours searching and keep coming up short. I tried for quite some time to find it online too, and then phoned the magazine for permission to use, but I’m not allowed to share due to copyright. 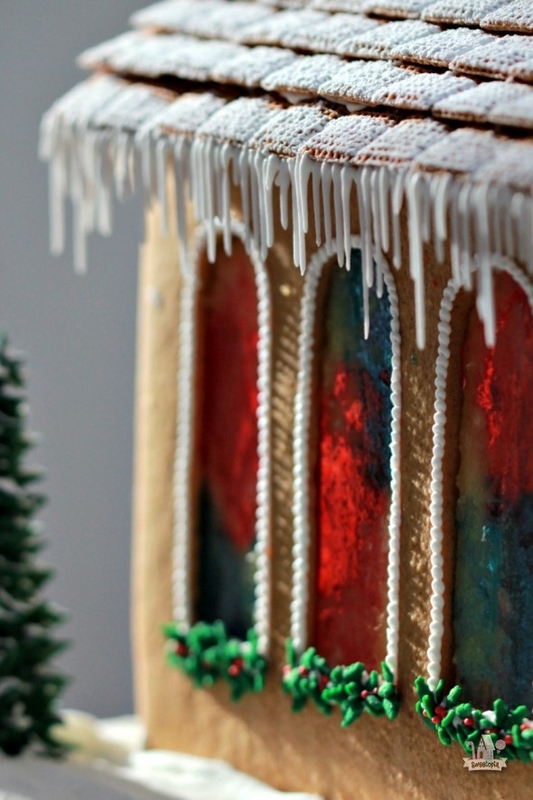 How big did you do the gingerbread church? May I have a copy of the template for the gingerbread church? This is absolutely stunning. I have made several houses using your recipes and templates that turned out great. I think I might try my hand at the church this year. That’s wonderful! Have fun Kim! I made the Christmas Chapel in the 90’s and it was beautiful. 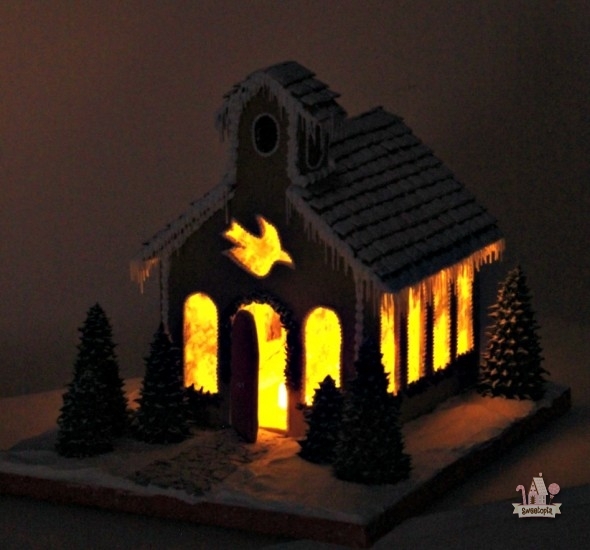 I still have the original template pieces and instructions and I plan to make the chapel with a friend who is a very talented cake decorator. She has never had the fun of doing a project like this. I love the tea lights to display it. The only info on my pages is that this project was produced by WW Food Editor Betsy Jordan. That’s wonderful to hear Nancy! 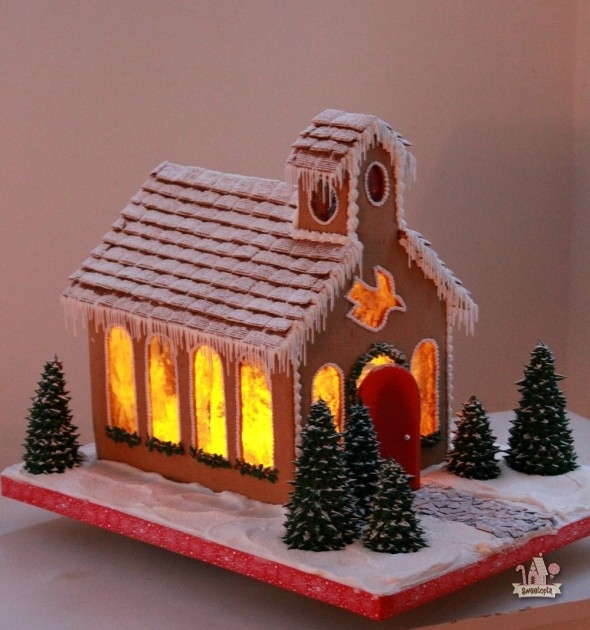 Thanks for sharing and have fun gingerbreading with your friend! Hi, Marian. I absolutely love your work! I am curious as to how you turned the lights inside the church on and off. Did you have any luck with putting the lights on cardboard and pulling them out the front door? I have been searching everywhere for a solution! I really want to put lights in a house but can’t figure out how to turn them on and off. Any suggestions? Thank you!! Hi Karen, thank you! Yes, the cardboard worked but another idea I’ve seen in Teresa Layman’s book are to drill a hole in the bottom of the base where you want your light. More work that I preferred not to do, but it’s an option! In regards to the lights: A larger (fat and short) candle with a remote might work.